Novermber 2,2015- Via The Nation wrote by VISARUT SANKHAM (THE NATION October 26, 2015) FISHERMEN have planted in the sea an artificial reef with 97 tonnes of coconut leaves, braided ropes and concrete pillars off the eastern province of Rayong early this month in a bid to raise the fish population, which has slumped following a massive oil spill off Koh Samet two years ago. In what has been dubbed the biggest joint operation between the Rayong fishermen and their allies, they have embarked on a project to build "fish houses" along a 100-kilometre stretch of the Rayong coast. The fishermen raised the budget themselves to buy the materials for the makeshift "fish houses", which contain baby fish that are supposed to boost the fish population. The fish houses will look like trees under water and the concrete pillars will hold them in place. 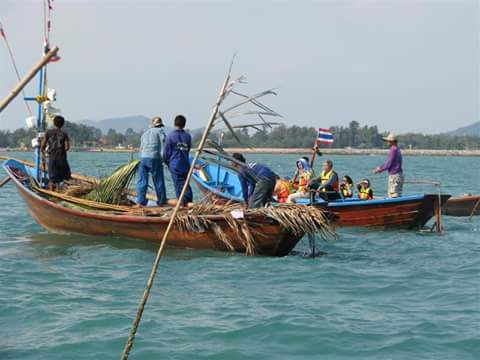 A batch of makeshift "fish houses" were lowered into the sea on October 23 at the Rayong Fisheries Association's centre in tambon Ta Pong in Muang district. The fishermen picked that auspicious date, which was a national holiday to commemorate the passing away of King Rama V, to bring their cause more luck. This period is also known as the fish egg-laying season. Although two years have passed since the oil spill, the fishermen around Rayong Bay insisted its effects still linger and can be seen in their daily lives. Things were particularly bad for several local fishermen whose catch shrunk and their income dramatically lowered to the point where they had to sell their fishing boats, according to local fisherman Veerasak Kongnanong. Before the oil spill, each fisherman could expect to catch at least 30 kilograms of healthy fish per day, but now they are lucky to catch five kilograms, Veerasak said. Another local fisherman, Arkom Keamglang, said he had to venture further away from his usual area, which ran out of fish. He tried many new places like Khao Munnok, Bang Saray, Khao Sam Roi Yot and Khao Talu. However, he couldn't afford to pay for the oil to take his trawler that far that often, he said. In one week, he can go fishing only a couple of days and sometimes all he catches are small mackerel. "After the oil spill, there was no agency to take care of us. Sometimes I feel like we are not even humans in their eyes. Since 2013, I have lost more than Bt100,000 in expenses to maintain my fishery activities and now I have no money left for my son's tuition," he said. Naowarat Tuphucha, a fisheries worker and shrimp paste maker, concurred that the fish supply has dropped rapidly in the past couple of years. She said sergestid shrimp, the main ingredient for shrimp paste, was also gone, so she has to go 130 kilometres to buy the shrimp in Chanthaburi province. "We have been suffering for more than two years, and nothing seems to be better. We don't even know when it is going to be better, so now the best thing we can do is to try fixing the damage by ourselves and hope it would get better soon," she added. Local fisherman Sunt Kemjarun lamented the fact that his life has not been the same since the oil spill because he can't fish in the same area. He can't even venture further out to sea because it's not worth it. Even though he is suffering a loss, people of his age cannot just change jobs. 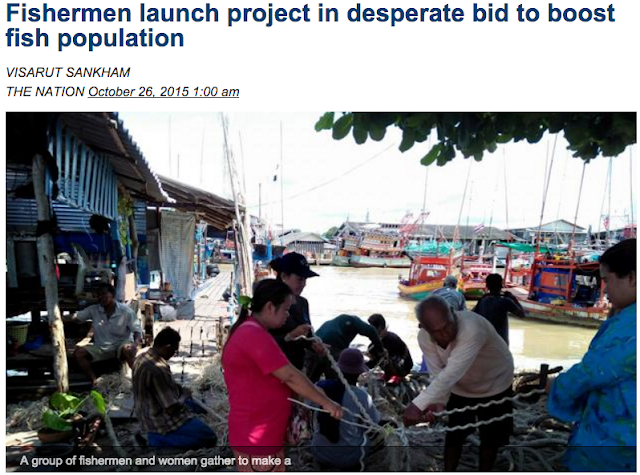 Meanwhile, many fishermen have sold their boats and shifted to other ways of making a living. Many families have also developed related problems such as family disunity because they had to change occupations and some family members had to move to the city. Despite the efforts of the vil lagers to get related agencies to tackle the issues and punish those responsible, no progress has been made. 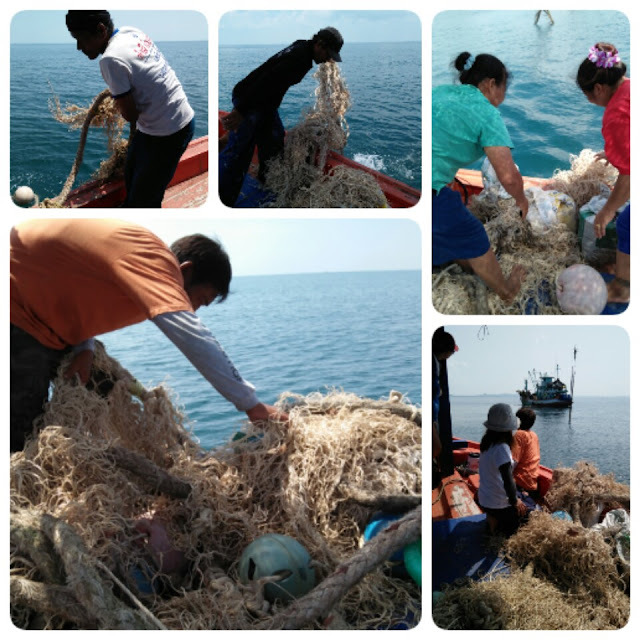 The Rayong fishermen have asked the provincial governor to shut down the bay area for three months, starting from September to November, to give nature a chance to heal itself. 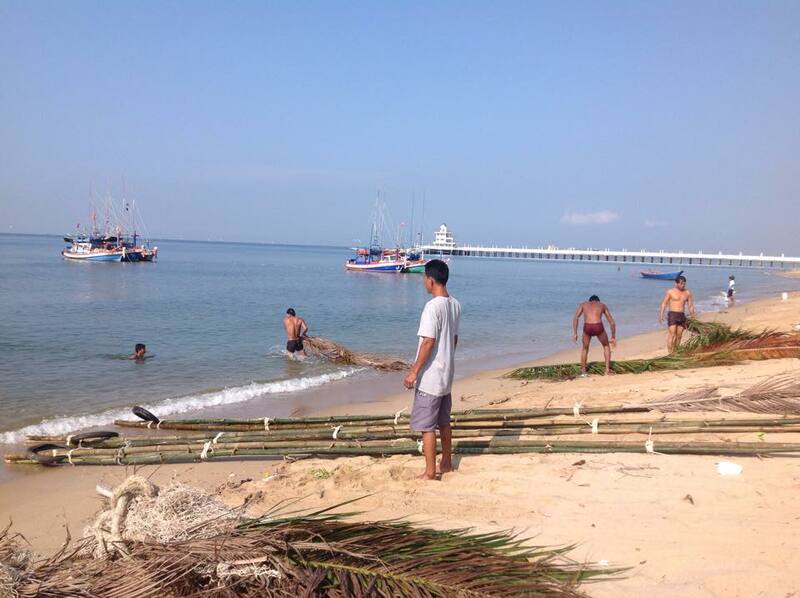 In the hope of getting their lives back to normal as soon as possible, the fishermen have gathered to build these "fish houses", made from nature and using materials such as coconut leaves and tied ropes.